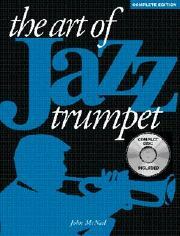  The first comprehensive study of modern jazz trumpet playing. The book contains a personal history of jazz trumpet, a selected discography, and in-depth analysis of phrasing, articulation, valve technique and alternate fingerings, as well as exercises to develop jazz articulation, rhythmic diversity and finger coordination. "At last! Jazz trumpet players finally have a book of their own! John thoroughly covers the main topics relating to jazz trumpet technique. I especially liked his informative history of modern jazz trumpet. I highly recommend The Art of Jazz Trumpet to both students and professionals."  John McNeil is a jazz musician living in New York City. A faculty member of New England Conservatory of Music, he has recorded numerous albums under his own name and has performed with Horace Silver, Gerry Mulligan and others.